I blog for the Lorax who speaks for the trees. Do everything you can to clean up the earth, PLEASE! 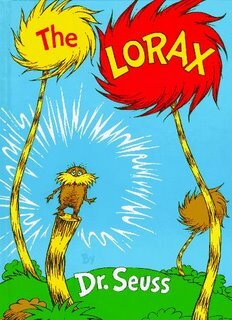 Dr. Seuss’s, The Lorax has long been a popular environmental children’s book. In his magical display of rhyming and timing Dr. Seuss shines a light on the effects “progress” has on the environment. The movie of course is not as good as the book–but it’s fun to hear the Lorax speak, watch the Onceler’s empire grow , and hear songs created just for this animated special. Watch the video with your kid(s) after the break. And pick up the book–it’s even better! Ban Dr. Seuss’ The Lorax? The Lorax’s interactive web-page–great Earth Day And everyday) ideas!